In collaboration with the South Fremantle Football Club, students have access to specialised coaching staff and AFL selectors, facilities and education programs. Training, skills development and individualised game analysis all support each student in the program to achieve excellence within the game and opportunities to pursue future pathways. Involvement in the AFL Academy also presents links to learning and education through biomechanics, physiology, health and nutrition and a Certificate course in Senior School. 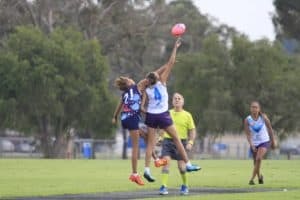 Students in the AFL Academy represent Fremantle College as a team, and are expected to demonstrate leadership, responsibility and teamwork in all aspects of their schooling and game. If your child has a keen interest and ability in AFL and enjoys being part of team, we invite them to apply for our AFL Academy. Applicants will be required to participate in an afternoon trial session and a group interview.